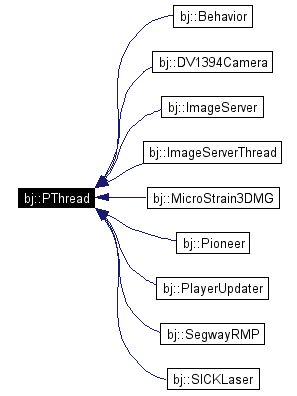 Inherited by bj::Behavior, bj::DV1394Camera, bj::ImageServer, bj::ImageServerThread, bj::MicroStrain3DMG, bj::Pioneer, bj::PlayerUpdater, bj::SegwayRMP, and bj::SICKLaser. Copy from an existing instance. Compare the thread identifier to itself. Put a running thread in the detached state. Wait for termination of another thread. Send a cancellation request to itself. Determine whether the thread is created in the detached state. Check whether the thread is created in the detached state. Change the cancellation state for the calling thread. Change the type of responses to cancellation requests for the calling thread. Test for pending cancellation and execute it. A wrapper class for POSIX thread functions. PThread class provides an object-oriented way to create a POSIX thread. A thread is supposed to inherit this class, and implement thread capability by overloading the function run(). This function should be overloaded by inherited classes to implement thread capability. Implemented in bj::DV1394Camera, bj::Behavior, bj::Pioneer, bj::PlayerUpdater, bj::ImageServerThread, and bj::ImageServer. It should be called before start().